Want Authentic Spanish Paella at Home? Get a Paella Pan! Paella is considered Spain’s national dish. It is essentially a rice casserole that includes vegetables, meat or fish, and herbs, particularly saffron. Families pass down their recipes over generations. Paella is cooked and often served in a specialized pan, itself called a paella or paellera. It is characterized by its shallow depth, sloped sides and loop handles. If, like me, you don’t have a Spanish grandmother to pass down her paella pan, you can buy one with a pretty small investment. Read on to learn more about paella—its origins, ingredients, and what to look for in a paella pan. I’ll review some of the more easily available and highly rated paella pans. Feel free to click the links in the table below to see current prices and reviews on Amazon. Do some quick research on the origins of paella, and you’ll get different stories. The common thread is that the Moors brought rice cultivation and saffron to Spain around the 10th century. By the 1400’s, rice had become a staple in Spanish cuisine. Beyond that, the details get murky. Some will explain that paella has its origins in the working farm fields, where workers would cook their midday meal over open fires. Others will explain it started off as more of a special occasion, picnic-type food, cooked out in the countryside. It’s a food of passion and pride—and debate! So naturally, there are some rules about what has to be included in a good paella. The essential ingredient is rice. And not just any rice! It must be a shorter grain rice does a good job of absorbing liquid without getting sticky—the grains should remain separated from one another, unlike a creamy risotto. Bomba rice is considered the best. Another important ingredient is olive oil, a hallmark of Mediterranean cuisine. Then you have the sofrito, a puree made of sautéed tomatoes and onions, which gives the dish its base flavor. The liquid is another essential component of paella. Typically, it’ll be a chicken or seafood stock infused with saffron (for flavor and color). Finally, paella includes a mix of meat or seafood and vegetables. 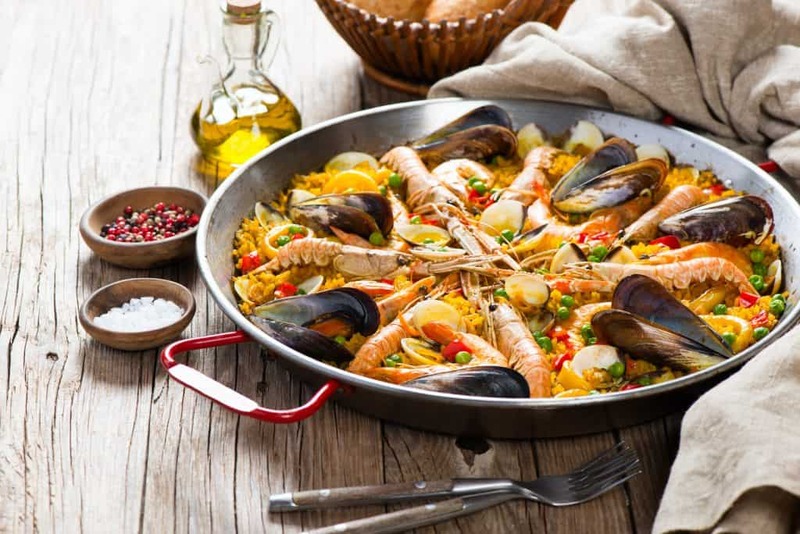 Seafood paella seems to be most common in North America, but apparently the most authentic Valencian paella is made with chicken, rabbit, and snails! Whatever the preparation, a good paella is judged by the socarrat, a caramelized crust of rice that forms on the bottom of the pan. This sets it apart from a more generic rice casserole, and it’s one of the reasons the pan is important. One of the most exciting aspects of paella, in my opinion, is how it is traditionally prepared over an open fire outside. It would make such a fun variation on the backyard barbecue! I can also imagine making paella over a camp fire (maybe after a bit of practice at home!). Watch this paella being prepared outdoors on a dedicated paella grill setup. For the average home cook, your backyard grill will do. You can also make a decent paella on your stovetop. Sometimes a recipe will call for paella to finish in the oven. How you will typically prepare your paella is an important consideration when choosing the next essential of paella: the pan. The paella pan is what makes all of these elements come together in the dish that is known as paella. The specialized design of the dish cooks the rice evenly while absorbing the rich flavors of the broth and other ingredients, but without getting sticky. The pan is also essential in forming that crusty-delicious socarrat (crusty, not burned). Paella pans share the signature shallow, round design, with sloped sides and handles on the sides. Paella pans are wide, as the rice mixture needs to stay shallow in the pan—no more than about a 1/2” thick. Sizes vary to accommodate different cooking situations and crowd sizes. A good pan should be fairly thin, so that it can cool down quickly when removed from the heat. Cast iron is not recommended, for example, because it retains too much heat. Most paella pans are made of carbon steel. You’ll also find them in copper, enamel over steel, and stainless steel. You can find non-stick versions, too, but achieving the socarrat might be difficult. Whatever material you choose, be sure to follow the care instructions for your pan. The most significant consideration is probably the size. If you are going to cook your paella inside on your stove (which is the most practical, though not traditional), you need to be sure it can fit on your stovetop and possibly into your oven. Depending on the design of the stovetop, you might be able to fit it across multiple burners, but it will be hard to evenly head a very large pan. Measure the interior of your oven to know your maximum pan size. If you are going to cook your paella outside, measure the width of your grilling area, and be sure to account for the paella pan’s handles when considering the size (these will add about 4.5”, while the paella pan size listed typically refers to the rim-to-rim diameter of the pan. 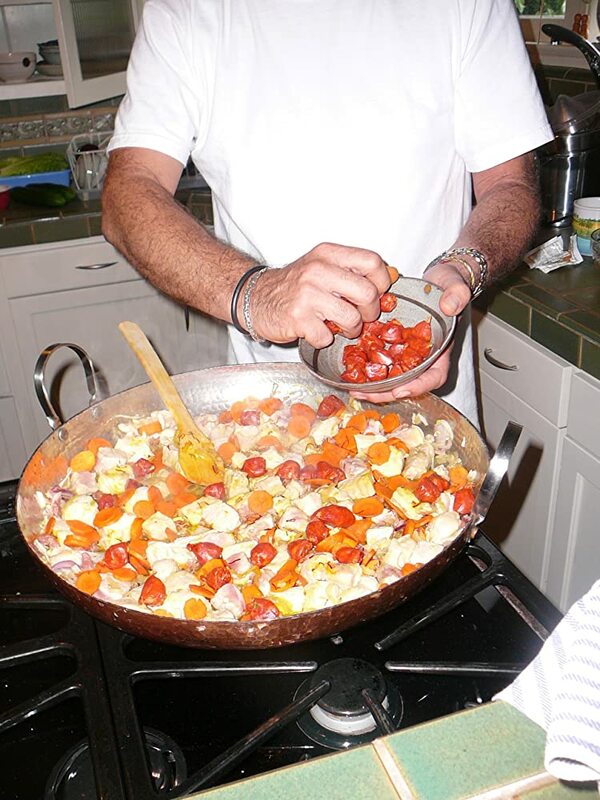 In addition to making a great paella, serving your paella in a paella pan gives you that wow factor. Furthermore, there’s no reason you can’t cook other things in what is essentially a specially-shaped skillet! Given that there are a lot of affordable options, a paella pan is an easy investment. This is the iconic paella pan style, made from raw carbon steel with red painted handles and a dimpled bottom. This is similar to what an average family would own—nothing too fancy but it does the job. This Garcima line is produced by La Paella, a Spanish company, and this seems to be their lower-end line. They make a very large range of sizes in this line. It comes with a pamphlet of tips and a few recipes to help get you started. Most users find this pan works just fine. 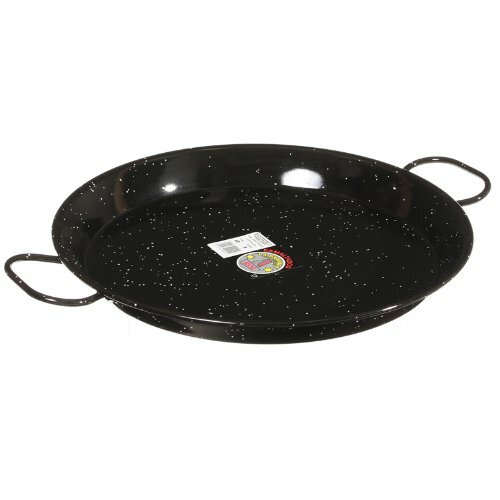 I think this is a good option if you’re looking for a large sized pan, or maybe a dedicated camping pan, but want to keep the cost reasonable. Carbon steel of this nature will rust quickly, so it must be dried immediately and oiled right after washing—most customer complaints revolve around this issue of quick rusting, but you can avoid this by following proper care instructions. An enamelled pan is a nice option if you’re concerned about the maintenance of raw carbon steel. I love the ease of cleaning my enamel cast iron pot, so I can imagine how easily this pan will clean up. Although carbon steel seems to be marketed in North America as the ideal, authentic paella pan, people who have actually travelled to Spain note that most Spanish people don’t make a big deal out of what the pan is made of, as long as it’s a dedicated paella pan. Those who own this particular pan find that it works great and still forms a nice, crunchy socarrat. The main drawbacks of an enamel pan is that it adds a bit of weight, a bit of cost, and the enamel can chip over time if handled improperly or dropped accidentally. If you’re planning to use this outside on a stone patio for example, that might be something to consider. Like the other Garcima pan, it comes with a pamphlet with tips, recipes, and instructions. La Paella, the company also behind Garcima, makes a number of paella pan sizes in this “Pata Negra” line. This is a traditional style paella pan made in Spain of carbon steel. 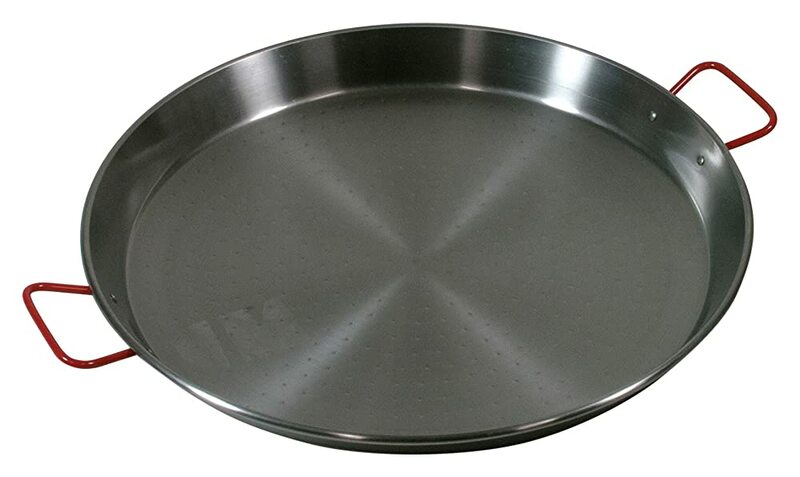 As a restaurant grade pan, it is thicker than a number of the standard models on the market. Most reviewers really seem to appreciate the added heft and had very good success preparing paella at home with this pan. This also comes with a pamphlet of paella recipes and tips for care of the pan. Like other carbon steel pans, proper care is important as it can rust if left wet. While it’s true you don’t have to spend a lot of money on a paella pan, you certainly can, and this would be the pan to splurge on. This company crafts all its pots and pans by hand, and it the attention to detail is evident. With its hand-hammered copper exterior and artisan look, this pan is just gorgeous. This is a piece of craftsmanship, not just a cooking tool. I also like that it is made with 100% recycled copper. And does it make good paella? According to lucky owners, yes, it does. Users note it heats evenly, which is key. The handles are a low conductivity stainless steel, so they don’t get super heated. Tin-lined pans require some careful care, so with such a large investment, be sure you know how to care for this pan properly. The thought of a crusty, flavorful paella is making my mouth water. Which pan would I buy? If cost was of no consideration, I’d definitely spring for the Sertodo Alicante 15. It’s just too beautiful to pass up, while still being a high functioning kitchen tool. But given that budget is a factor, I think La Paella 18″ Pata Negra Paella Pan is an excellent high-quality option. Though I know paella pans are meant to be thin, I like the idea of a bit more weight in my hand. Do you cook paella at home? Tell us your stories!